From: Martins LM, Marques AG, Pereira LM, Semião-Santos SJ, Bento OP. 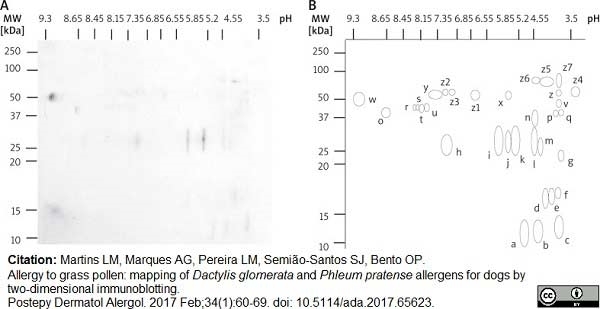 Allergy to grass pollen: mapping of Dactylis glomerata and Phleum pratense allergens for dogs by two-dimensional immunoblotting. Postepy Dermatol Alergol. 2017 Feb;34(1):60-9. Mouse anti Dog IgE antibody, clone E6-71A1 recognises canine IgE. E6-2A1 does not cross react with dog IgM, IgA, IgG1 or IgG2. Western blot analysis against affinity purified dog IgE using Mouse anti Dog IgE clone E6-71A1 demonstrates a single major band of ~62-65 kDa under reducing conditions. Affinity purified IgE preparation from heavily parasitized and allergic dog serum. The antibody may be used as a detection antibody in a sandwich ELISA in combination with MCA1895 as the capture antibody. Under reducing conditions MCA1896B detects a band of approximately 62-65 kDa in samples of affinity purified dog IgE. Under reducing conditions MCA1896 detects a band of approximately 62-65 kDa in samples of affinity purified dog IgE. Ognjenovic, J. et al. (2013) Immunoproteomic characterization of Ambrosia artemisiifolia pollen allergens in canine atopic dermatitis. Vet Immunol Immunopathol. 155: 38-47. Martins, L.M. et al. 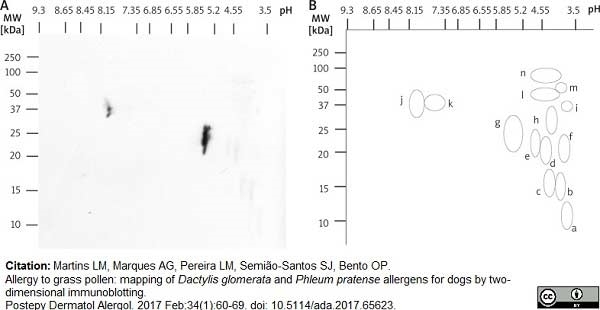 (2017) Allergy to grass pollen: mapping of Dactylis glomerata and Phleum pratense allergens for dogs by two-dimensional immunoblotting. Postepy Dermatol Alergol. 34 (1): 60-9.